Writers Malorie Blackman and Chris Chibnall deliver a well-written script that the actors execute brilliantly! Episode 3 gives us the first engaging and exciting story of series 11. After the mediocre opening and the dull misfire that was ‘The Ghost Monument’, it was refreshing to watch an episode that had so much heart and emotion behind it. ‘Rosa’ explores the historic and cultural importance of Rosa Parks (Vinette Robinson) and her struggle against racial segregation. 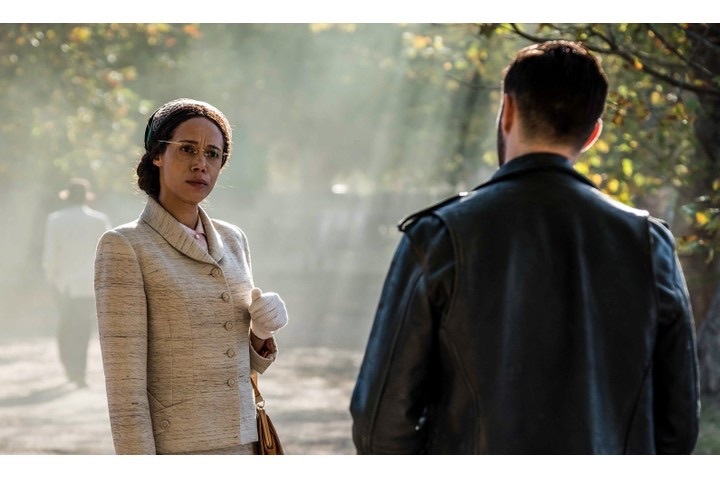 As racist time traveler Krasko (Joshua Bowman) tries to change time so that Rosa never stands up against racial segregation on a bus in Montgomery, Alabama 1955, it is up to the Doctor (Jodie Whittaker) and her friends Graham (Bradley Walsh), Ryan (Tosin Cole) and Yasmin (Mandip Gill) to ensure history remains intact. Some may argue that the themes present in the episode are a bit deep for a ‘kids show’, but this just goes to show that Doctor Who is not a kids’ show. The acting from most of the cast was very compelling and enjoyable, especially Bradley Walsh, who was as amusing as ever. Yasmin Khan was also substantially more developed in this episode, having been little more than a one-dimensional extra in the previous episodes and Tosin Cole gave his all when Ryan faced racism and abuse in the episode. Both recounting their experiences of racial abuse made the duo infinitely more complex and interesting for the viewers. However, it must be said that Whittaker was underused this week due to the story juggling so much in just a 50-minute time window. Nevertheless, Whittaker delivered an engaging performance as the high born Gallifreyan, especially during comedic moments such as the use of the Doctor’s invisible-writing pen and the revelation that she is Banksy… or is she?! As for the villain, Krasko was deeply underdeveloped and served only to share Rosa’s struggle with the time travelling team. Bowman gave a very underwhelming routine, with the confrontation between Krasko and the Doctor feeling rushed and out of place with the rest of the episode. Nevertheless, it would be very interesting to see the 51st century villain return later in the series, having been blasted through time by Ryan. However, it has been very refreshing to not have a big alien invasion for a while, instead having the heroes and supporting characters in the foreground. The teamwork that the Doctor and her friends portrayed this week stands this new ensemble apart from recent series wherein the Doctor had only one or two companions, making this infinitely more inspiring. Speaking of inspiring, Rosa Park’s journey to lead the civil rights movement was truly moving. However, she would have benefited greatly from more character development; as mentioned above, the story was attempting to juggle a lot of different arcs and would have benefitted from an extended runtime as certain points felt rushed. This is what makes me miss the relatively frequent two-part episodes from Russel T Davies’ era as they allowed for greater story development and character building. Although Murray Gold is still sorely missed after his departure as the incidental music composer, leaving enormous shoes to fill, newcomer Segun Akinola’s music excelled this week, with Rosa’s theme being a standout and the faster-paced music heightened the tension as the heroes rushed to keep history in place. It was also very heart-warming to see the Doctor and friends watching Rosa’s life history and her eventual success on what is reminiscent of the time-space visualizer from the First Doctor’s Tardis. However, after the grand reveal of the redesigned Tardis interior last week, it was disappointing to have the Doctor’s magnificent time machine feature only briefly. Upon viewing this episode, it was hard not to feel motivated by the bravery of Rosa Parks and at the same time horrified by the racial abuse that the characters suffered, visualising for a modern day audience from a more equal society what it was like to be black in 1950’s America. The depiction of the period was extremely unsettling and, unlike recent stories, ensured there was a real danger throughout, especially for Ryan. Of course, prejudice and discrimination are themes that have been tackled by the show several times, most recently during ‘Thin Ice’ but this was the first episode that truly grounded it in human culture rather than blaming it on Victorian values. These themes fit in well with the nature of Doctor Who whether the central protagonist is facing conflict between Silurians and humans, gangers and their original copies or white people and black people, the message of equality reigning supreme. The highlight of the episode was when the Tardis visited the asteroid named after the inspirational titular character. Overall, a thought-provoking installment in Chibnall and Whittaker’s first series and without doubt the most intriguing and entertaining story thus far this series. Hopefully the remaining 7 episodes will be as good, if not better. Despite it being let down by a bland enemy and run time that restricts the excellence of the episode, it will no doubt become a modern classic of the long-running series. Doctor Who continues next week with ‘Arachnids in the UK’ on BBC1.